Laird Digital Cinema Red One Camera TA3M Mini XLR to Female 3-Pin XLR Audio Input Cable - 18"
The Red One Camera TA3M Mini XLR to Female 3-Pin XLR Audio Input Cable - 18" from Laird Telemedia is designed to be used with the Red One camera, which has four 3-pin mini XLR lin/mic inputs recorded at 24-bit 48kHz. 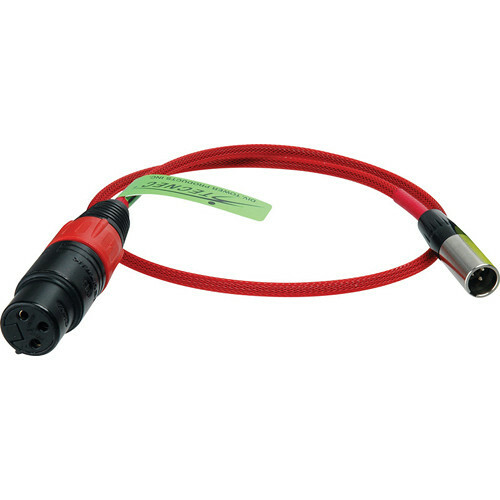 This cable allows you to send analog audio to the Red One from a standard 3-pin XLR whether it's a shotgun microphone, handheld microphone, wireless receiver or similar audio source. The cable is hand crafted and features Belden 1804A Low Impedance Quad Star cable. Connectors are Switchcraft and Neutrik, and the cable is wrapped in Techflex tubing for added protection. Please note! This cable is compatible with Rev. B cameras only. Box Dimensions (LxWxH) 6.15 x 4.2 x 1.4"
Red One Camera TA3M Mini XLR to Female 3-Pin XLR Audio Input Cable - 18" is rated 5.0 out of 5 by 1. Rated 5 out of 5 by Steve from Works great! I use this for my Black Magic 4K Video Assist. Phantom allows me to use multiple audio devices. Will this work with the mini XLR port in the Blackmagic Pocket Cinema Camera 4K?